Sparkle XRM provides a great way of creating grids and forms that look and work similar to Dynamics CRM but sometimes you need to create a responsive user interface that is a little different. Luckily there is a wealth of jQuery plugins out there that provide a great starting point. For this post I'm going to show you how to use FreeWall to create a dynamic grid layout of contact cards but the same approach would apply for any other plugin that isn't included in the core Sparkle XRM dependencies library. 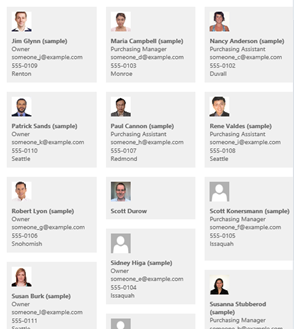 This sample creates an HTML web resource that lays out your contacts in a responsive grid that resizes depending on the size available. The HTML View should be added to the html folder and must contain the scaffolding to hook the jQuery library into and initialise the View code. The data binding is done using Knockout's built in templating engine using the 'template' binding. The view class's job is to instantiate the View Model and initialise the binding. Notice the OnAfterRender call back – this is called every time a new contact card is rendered because of the binding afterRender: Client.InlineSubGrids.Views.ContactCardView.onAfterRender in the HTML. If this is not done then the freewall grid will not layout until the window is resized. The result is a nice and responsive layout that optimises the fill the available space and has variable height blocks. Here are my choice of the top CRM articles this week.